Extraits d'informations centrées sur le local : photographie, cartographie, techniques immersives, vidéos, 3D, télécommunications, Web, mobiles, wifi, RFID, 3G, GPS, vie locale, commerces, services, services à la personne, enrichissement de l'information, autoproduction. If you have a Google Map API key (free), you can generate code to create a static link to this map (static meaning just the image itself, not scrollable or zoomable). 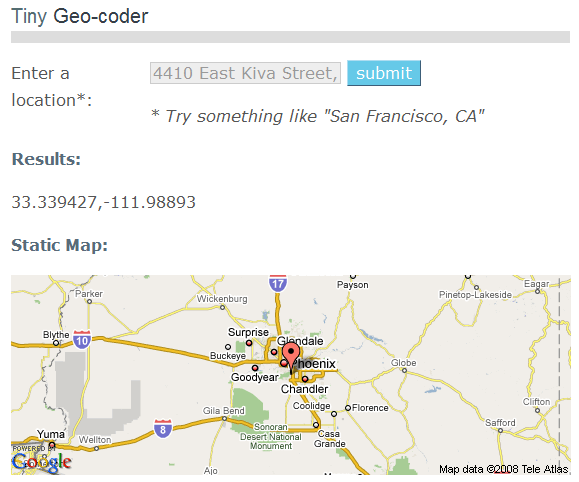 And for web gearheads, there’s a simple and free API available for geocoding and reverse geocoding. Here’s an example of geocoding for Provo, Utah, and reverse geocoding for 37,-110.